« Annual Sales of EVs Exceeds One Million. Prepare – Withstand – Adapt – Recover. “Resilience and Stability of Ecological Systems” was a paper by the Canadian ecologist C.J. Hollings published in the Annual Review of Ecology and Systematics 1973. The concept of resilience was used to describe the persistence of natural systems in face of changes in the ecosystem. The paper has had a major impact within ecology and the concept of resilience has later been expanded to many other areas, including the electric grid. The 2003 Northeast blackout and extreme weather events like hurricane Katrina (2005), superstorm Sandy (2012), polar vortex (2014), hurricanes Harvey, Irma and Maria (2017), as well as awareness of new risks, such as physical and cyber-attacks, etc., have contributed to the increased attention to the resilience of the electric grid and ways to strengthen it. Department of Energy (DOE) Sandia Labs has taken the lead in developing a “conceptual framework for developing resilience metrics for US electricity, oil and gas sectors”. In a paper (2015) with that title Sandia Labs describes a Resilience Analysis Process (RAP), which can be used to assess baseline resilience and evaluate resilience improvements. The Resilience Analysis Process (RAP). The steps of which progress counter-clockwise from “Define Resilience Goals”. 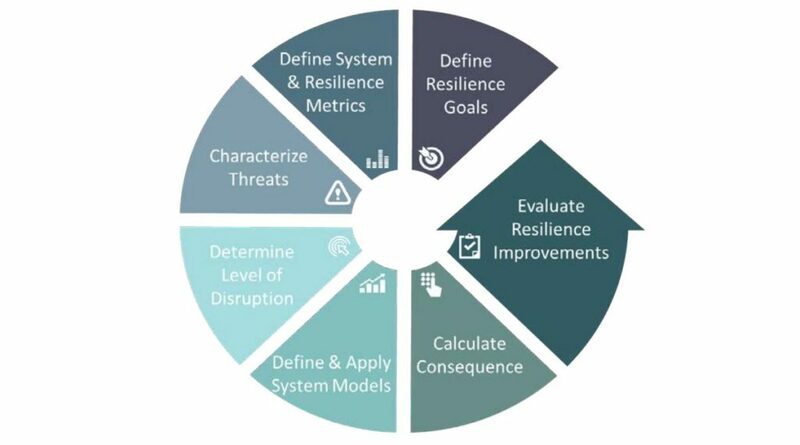 Sandia Labs also developed a helpful structure in identifying system attributes that affect the resilience metric. It groups resilience capacities in four categories: Prepare, Withstand, Adapt and Recover. The National Academy of Sciences last year (2017) issued a report, “Enhancing the Resilience of the Nation’s Electricity System”, focused on “identifying, developing, and implementing strategies to increase the power system’s resilience in the face of events that can cause large-area long duration outages: blackouts that extend over multiple service area or states and last several days or longer”. The report analyzes different types of events that can cause outages and make several recommendations to better prepare for, withstand and restore after an event. The latter is complicated, since the restoration processes are different depending on the nature of the event. Edison Electric Institute (EEI), representing the investor utilities (IOUs), has done a lot not only to share best practices in terms of resilience measures but also in terms of developing cost recovery mechanisms and guidance on regulatory frameworks. In its paper “Before and After the Storm” (updated March 2014) EEI describes hardening measures focused on making the electric grid more robust. They include undergrounding, vegetation management, higher design and construction standards, smart grids, microgrids and advanced technologies, for example mapping technologies such geographic information systems (GIS). The report also describes resiliency measures focused on improving restoration capabilities by increased labor force, standby equipment, restoration materials, enhanced communication, planning and coordination, and advanced technologies, for example airborne damage assessment including the use of drones. EEI early developed a mutual assistance program, which is the foundation for electric utilities assisting each other in restoration after outages. The program has proven its efficiency in significantly speeding up restoration after extreme weather events. For example, at superstorm Sandy, almost all power was restored within 14 days, not least thanks to the mutual assistance program, at its peak, with over 60,000 utility crews and their equipment. After Sandy EEI enhanced the program (2013). Also, American Public Power Association (APPA), representing the municipal utilities, and the National Rural Electric Cooperative Association (NRECA), have similar mutual assistance programs. 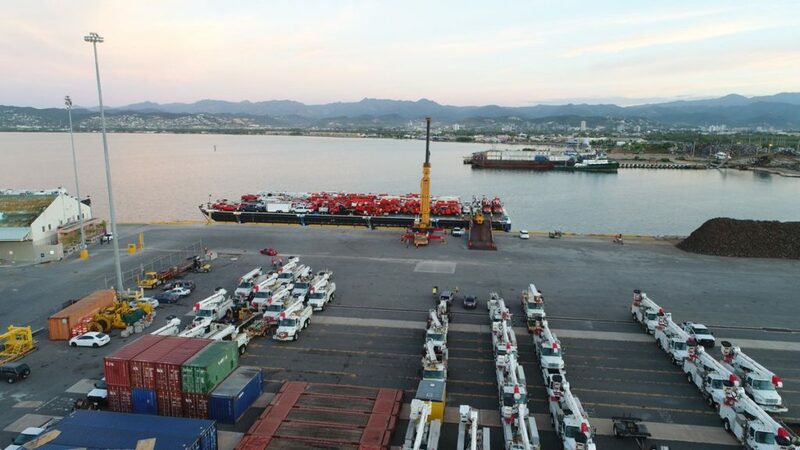 Barges of utility trucks from Oncor and Oklahoma Gas & Electric arriving to Puerto Rico. Hurricane Maria hit Puerto Rico September 20. Unfortunately, no mutual assistance agreement was at that time in place. Once requests for assistance through EEI and APPA were made, agreed and formalized, massive support equipment and crews from many electric utilities from the mainland starting to arrive in force in January. New technologies can also help in restorations. For example, HVDC VSC (Voltage Source Converter) adds another dimension of controllability, for example by ability to provide reactive power for voltage support. VSC being able to operate independent of surrounding HVAC system, it can also provide black-start capabilities, which has been demonstrated by ABB in a live test 2015 on Åland, Finland, (https://www.youtube.com/watch?v=RLqe0PvfMUQ). It seems not to be a coincidence that 13 of the 32 HVDC links built or under construction in Europe since 2011 have the VSC technology. Looking at the other resilience capacities, Prepare-Withstand-Adapt, it is worthwhile to notice that the electric transmission system is designed to Adapt! To comply with the North American Electric Reliability Corporation (NERC) standards the transmission system has not only to withstand the loss of a major generating unit or powerline (N-1 criteria), but also the loss of an additional major generating unit or transmission line (N-1-1 criteria). There are also promising developments trying to find ways to integrate resilience in the transmission planning, for example by PJM with methodologies like “Cascading Tree” analysis, which can help in evaluating routing alternatives of new transmission lines. In terms of Withstand, it is much about what EEI calls hardening. Undergrounding, cables in the ground instead of towers and wires, much improves the resilience of the electric system. Same thing for gas insulated substations instead of conventional air insulated substations. Even though initial costs to do so are high, it may be justified for critical parts of the system. New conductor technology like ACCC conductors has, in addition to performance benefits, substantial resilience benefits. The composite (carbon) core is twice as strong as the steel core in conventional conductors. 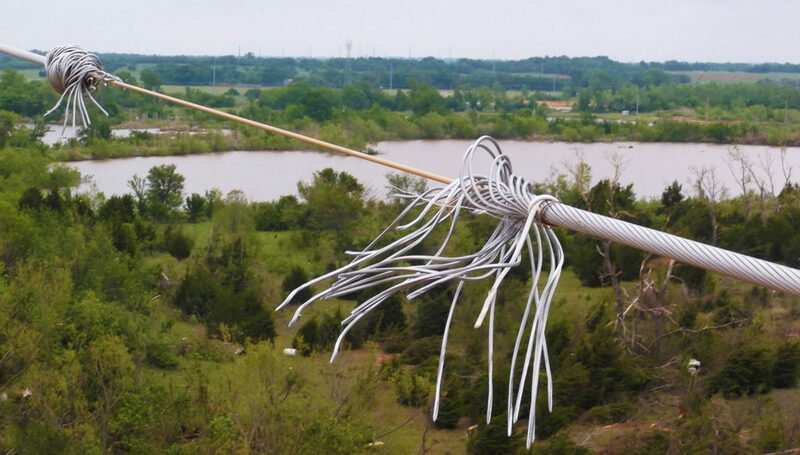 The picture shows the ACCC conductor core intact after an EF4/EF5 tornado hit a transmission line in Oklahoma (2013), flying debris knocking over a 125-foot-tall steel monopole, snapping the aluminum strands of the conductor. Linemen could repair the conductor by splicing it. If the conductor had snapped, the restoration would have taken much longer. In terms of Prepare, one of the most significant development during the last 10 years has been the installation and use of phasor measurement units (PMU). PMUs provide not only a step function improvement of amount and speed of power systems data, 30-120 times per second, networked PMUs are time synchronized. It means they can provide a much more accurate view of the status of the system over a wide area. Imbalances, oscillations and other potential problems can be detected earlier. In fact, it is possible the 2003 blackout could have been avoided, if the grid operators had had access to all the PMUs now installed. 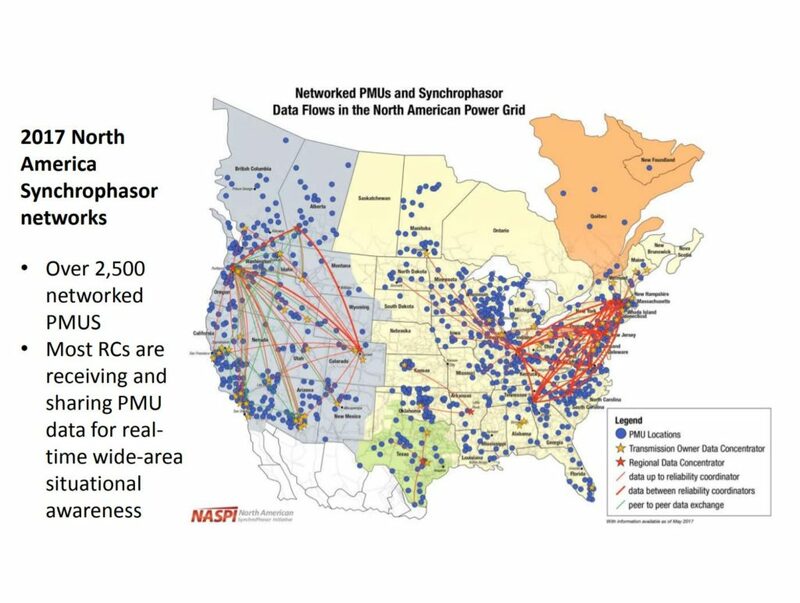 The North American SynchroPhasor Initiative (NASPI), created by DOE and NERC in 2007, brought a collaborative effort with government agencies, industry, academia and vendors. It has been instrumental in development and deployment of PMUs. Grants from the Recovery Act (2009) helped accelerating the process. The transmission grid is the backbone of the electric system. By enabling more variable generation resources, wind and solar, the value of large grids has further increased. Reducing the risk for blackouts and strengthening the resilience has become a prerequisite. The challenge is finding the optimal balance between investments and potential benefits. Substantial progress has been during the last decade strengthening the resilience, but with more types of severe threats, this is not the time to declare victory and relax.